It’s awesome, and I’m in the middle of it right now. And while there’s a lot of shop talk and nerd talk, there’s also been so much that we can all benefit from. 1) We get attached to our stories, and they define our possibilities. As Mark Milligan put it today, we marry our diagnosis, and it becomes part of our identity. And this tends to put us out of control, focused on factors driving our life that are outside ourselves. We think someone needs to fix us, fix something broken, or even think that we can’t be fixed, or only fixed under the knife. If instead we start to shift our view of control to what we do have a say in, focusing on what we CAN do, how we can care for ourselves and seeking out care from others that engages us instead of making us passive recipients, then a whole world of possibilities open up. 2) And one story we tell often in our culture is that there is one right way and many wrong ways of using our bodies. We label lots of perfectly natural variation in movement and in biomechanical structure as faulty, even dangerous. But the truth is, we are not weak or wrong. And even what we normally think of as broken is often perfectly normal. As Greg Lehman pointed out today, there is a ton of research showing that most of us have things like osteoarthritis, tears in our cartilage, herniated discs and more without any symptoms at all. And when we do have symptoms, we can often restore function and reduce pain without changing anything about that underlying physiology. We often get stuck trying to figure out the physiology or the biomechanics of what’s wrong with us. Instead of worrying about all that, we should focus on discovering what works for us. 3) It’s not all about getting rid of pain, though. What really matters to most of us is living a full life, and doing so in the face of our struggles. Pain and distress are part of life, and we can’t really get away living without experiencing them along the way. So where we do have pain, we can acknowledge it without letting it run our lives. We can experience pain without so much anxiety, distress and judgment. It’s experiencing pain with mindfulness, with acceptance. But Laura Simons today suggested acceptance with a twist. That twist is to allow it to be OK that something is wrong, for now. I love this because it simultaneously gets us to be present, but also leaves the door open for the future. It’s acceptance that doesn’t constrain us. 4) And that lets us choose to live life in the face of pain or distress. It’s natural that when we hurt, we try to stop hurting. This is great when you learn not to put your hand back on a hot stovetop after the first time you burn yourself as a kid. That’s useful fear learning in response to pain. But when pain is chronic and we try to avoid activities that aggravate our pain, over time, we simply stop doing most of those activities that we love. 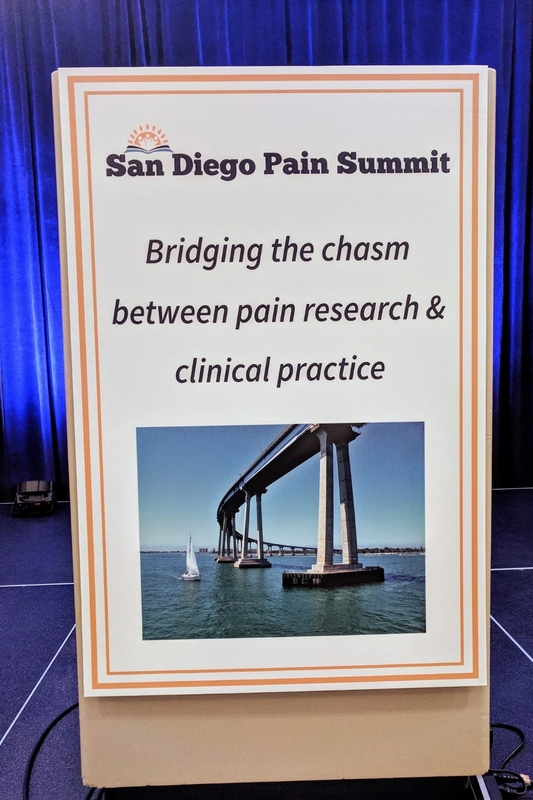 Rickard Wicksell presented research showing that pain and distress levels stay the same even as we cut out those things we love to do to try to protect ourselves. It’s not a good trade. So it behooves us to learn how to choose to go back to life, to live fully according to our values. 5) Pain can be a great barrier to life, especially connecting to others. We think of pain as an “ouch!” (or a different four letter word), but it hides a myriad of feelings. People in pain feel invisible and disconnected, because it’s natural to feel disconnected when your experience of the world is so different from those around you. To paraphrase Elaine Sherry, pain feels unsharable, and it has a resistance to words. Finding ways to express pain, to bridge that experience with others, is powerful and therapeutic. Mike Stewart today encouraged us to really listen for the metaphors we use for our pain, or to create them if we don’t have them handy — by drawing what our pain looks like, or picking a song that is like our pain, or connecting it to some other experience in our lives. Bridges of experience that can help us feel heard and understood, and then also invite us to create metaphors for how we would like to live instead, to give us a direction in which to move.